Well the first of the three Brimfield Shows of the 2012 season is a fading memory, but I have just a few more notes about my trip there last week to wrap it all up. 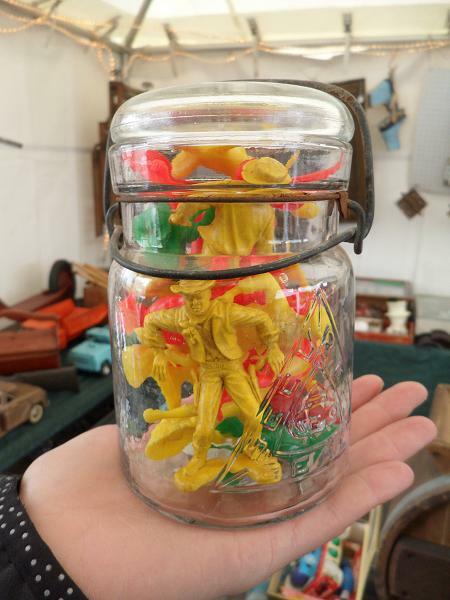 Lynda I came across a dealer who had some “smalls” displayed in old canning jars – like these vintage toy cowboys. I love the idea of it. I have so many of these types of things that are hard to display and think that this is a fun way to show off your collections. I can picture a mantle with various sized canning jars filled with dice, toy building blocks, buttons, old nails or any kind of small collectible. I have to say that my first-ever collection were the Matchbox cars I had when I was a wee lad. I not only played with them, I collected them and was a member of the Matchbox Collectors Club long before I ever thought they could be valuable. 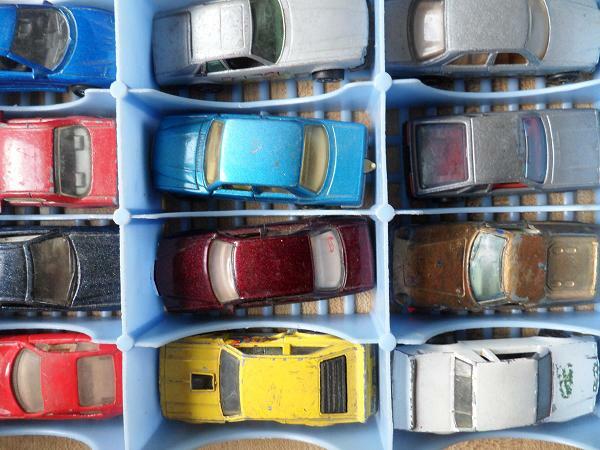 Anyway, we came across a dealer at Brimfield who had quite a collection of Matchbox cars for sale – from the high-end in the over $100 range – to the low-end, like these, a dozen for $8. Lynda helped me pick out this set which I will be using in a major art piece I am working on. Who’s up for a game of Mahjong? I haven’t played Mahjong in years, and when I did, it was a cheesy computer game version on my Commodore Vic 20 circa 1983. However, I have always loved the iconic Mahjong game pieces. 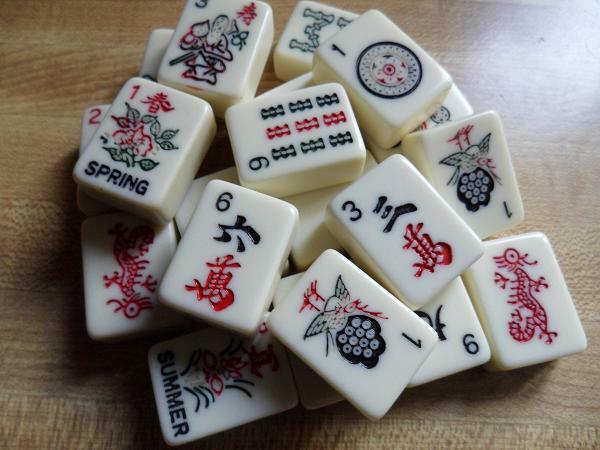 I picked up this mini-collection of Mahjong pieces at Brimfield – four for $1. I am not sure where they will end up, but I like just having them around. Finally. I picked up this diverse lot from a very engaging vintage toy dealer at Brimfield. 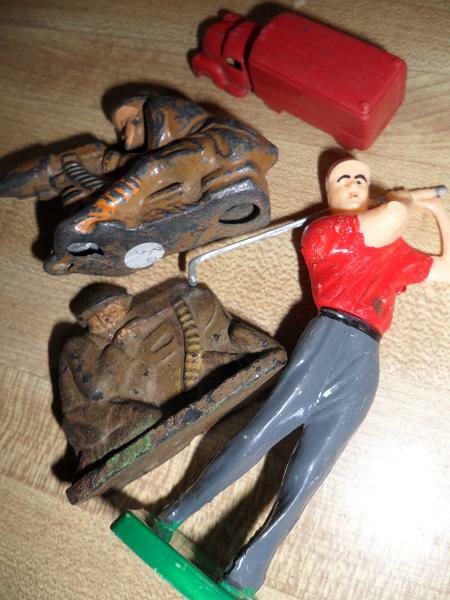 I am always a sucker for the mis-matched and/or damage toy solider (or “lost cowboy” as it were) and I love this vintage golfer cake topper and little red truck. I think this type of lot is my favorite kind of find at Brimfield and other shows. Lost Cowboy is powered by	WordPress 5.0.4 and delivered to you in 0.813 seconds using 45 queries.